Patrick Corbin is Overrated. Padres Go for Series Win. Actually, I have no idea if Patrick Corbin is overrated. He pretty easily dispatched the Padres last time he faced them. Plus, he seems to pretty easily dispatch most of the league. Regardless, we have new SECRET WEAPON Tyson Ross going today. His high 90’s fastball is dazzling all of us. Maybe once he decides to cut out 3-4 mph off his fastball and start hitting home runs like Andrew Cashner, we’ll really be cooking with gas with him. Or maybe he can just put it together. Either way, I’d rather watch Tyson Ross than Jason Marquis pitch. 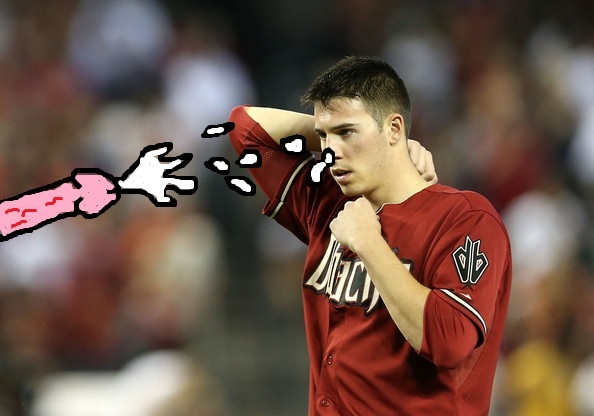 In the meantime, here’s Patrick Corbin getting blasted in the face which of course he’ll be doing metaphorically as well today by the deadly Padres lineup. And keep an eye out for the reincarnated Rally Unicorn if the Padres need it today. I mean, I hope they don’t but I drew it as being Vs. Diamondbacks specific. Just saying.